First we talked about the basics of hookah anatomy. 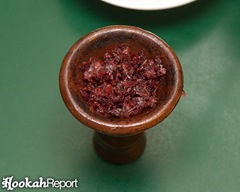 Then, we got into the gritty details of hookah charcoal. This week, we’re going to discuss what it takes to pack your tobacco in your bowl and get a great smoking session out of it. So, lets get started. 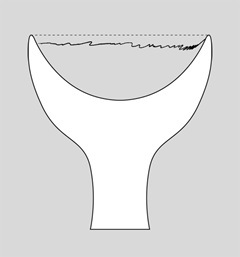 If you’re reading this guide, there’s a good chance you’re not using a specialty bowl, such as a Vortex or phunnel bowl. Rather, you’re probably using the bowl that came with your hookah. That’s a standard bowl. It may be an Egyptian bowl, a mod Bowl or a Mya bowl, but regardless, the routine for packing pretty much any of these will be about the same. So, for this guide, we’re going to assume you’re using some kind of a standard bowl. We’re going to teach you the most common, basic method for packing your bowl which, in general, is the most difficult to mess up. There are other methods and styles for packing, but we won’t get into those here. So you have your tub of tobacco, you have your bowl and you have a big roll of heavy-duty tin foil. So now what. 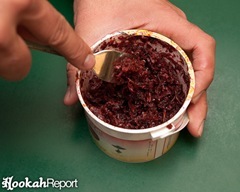 Well, before you load that juicy goodness into the bowl, you want to make sure your tobacco is as ready to jump in as you are. With the tobacco still in a tub or bag or Tupperware container, use a fork and stir it up. This will help to break up any clumps that have formed from it sitting for a while, but more importantly, it will bring the juices from the bottom of your container and thoroughly moisten your tobacco. This is extremely important in getting the best smoke possible. Some brands have more stems than others. Brands like Nakhla and Al Fakher often have sizeable stems which make packing the bowl kind of a pain. Picking these out will help. Start by filling your bowl with about the amount of tobacco you think you’ll want to use (we’ll get into just how much a little later), then dump it out of the bowl onto a plate or glass kitchen bowl. With your fingers, mix up the small portion of tobacco in the bowl. When you find a stem, pull it out and throw it away. Here’s where things can get tricky for some people, and where the term “packing” becomes kind of strange. 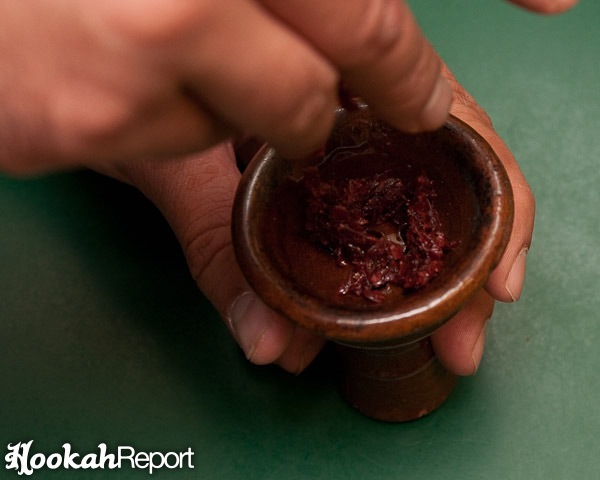 For a standard packing method, you want your tobacco to sit loosely in the bowl. You don’t want to “pack” it down, in fact, you want to fluff it up. You want to try and create as much volume as you can, with as little tobacco as possible. This usually means sprinkling the tobacco lightly into the bowl. Here are a few rules you will probably one day learn to break, but for now act as a good starting point. 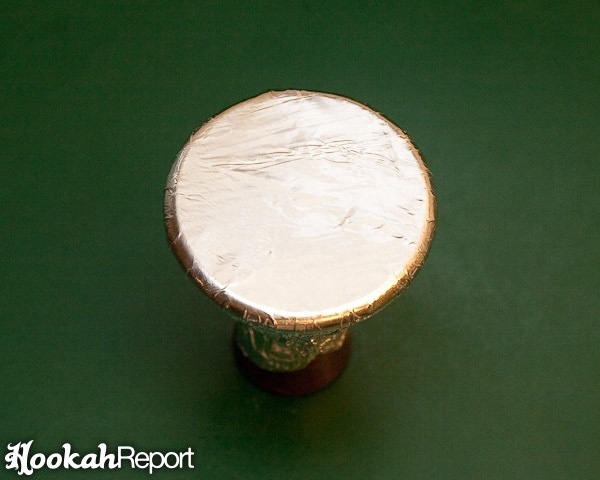 The holes at the bottom of your bowl play the first part in keeping a smooth and easy draw on your hookah. If these holes become clogged, it will be more difficult to pull smoke through. So, the first few sprinkles are the most important. As you drop the first of your tobacco into the bowl, try to avoid allowing globs of tobacco to fall right over the holes. Sprinkle lightly and carefully. This tobacco will help act as a structure to support the tobacco on top of it, therefore keeping your draw as easy as possible. The tobacco should fill about three quarters of your bowl after it’s been sprinkled in. Using less or slightly more tobacco is usually okay, but the key is to keep it away from the tin foil. Once you place your coals on top, tobacco that is touching the foil will burn quickly. And, with too much heat will go a long way to producing a burnt taste in your smoke. Nobody wants that. Avoid mounds in the tobacco. 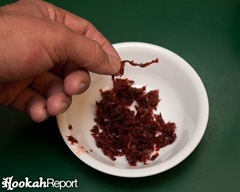 Creating a fairly even level at the top of your tobacco will help things burn evenly and smoke better and longer. The tobacco is mixed up. The bowl is packed. And now you’re wondering just what to do with the roll of tin foil you have sitting on the counter-top. 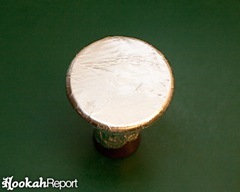 The tin foil is pulled over the top of the bowl and acts as a screen between the burning charcoal and the shisha tobacco. It allows the tobacco to bake rather than burn. Good tin-foil technique can make all the difference between a great smoking session and a terrible one. But, sealing the bowl with tin foil can be more challenging than it seems. 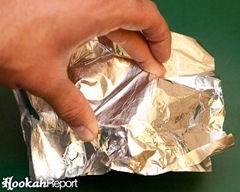 If your foil is too thin (heavy duty foil is recommended, but two sheets of standard tin foil will work too), or pulled over the bowl too loosely, the tobacco can burn unpredictably. 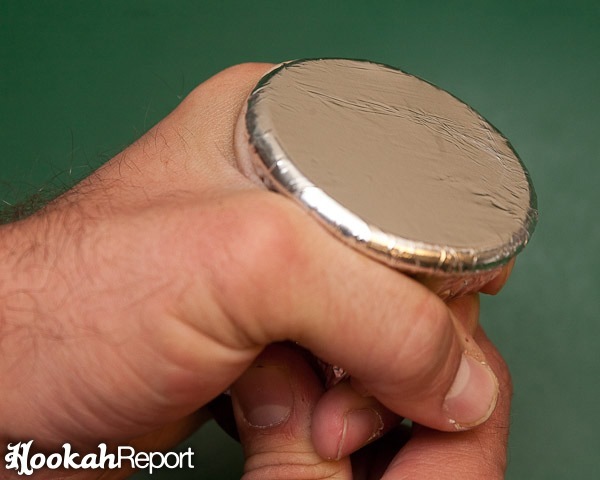 Until you develop your own methods (or tweak mine), try following these steps to seal the bowl tightly with tin foil. You’ll want to use a square piece of tin foil roughly 2.5—3.5 times the diameter of your bowl. It doesn’t have to be perfect, but this is a good rule of thumb. Try your best to avoid allowing wrinkles to form in your foil. Place the foil sheet, centered, on top of the bowl. Try to avoid pressing down on the foil in the center of the bowl. You don’t want to create a concave shape before creasing the foil. To create your crease, pull the foil down tightly on the outside of the bowl at two opposite points. This may case some wrinkles, that’s okay, they should go away. Place two fingers on the foil over the opposing edges of the bowl where the foil is the tightest so that it doesn’t shift. Now, while holding the two points of the foil tightly, gently pull the foil down around the edge of the bowl creating a crease in the bowl’s shape. 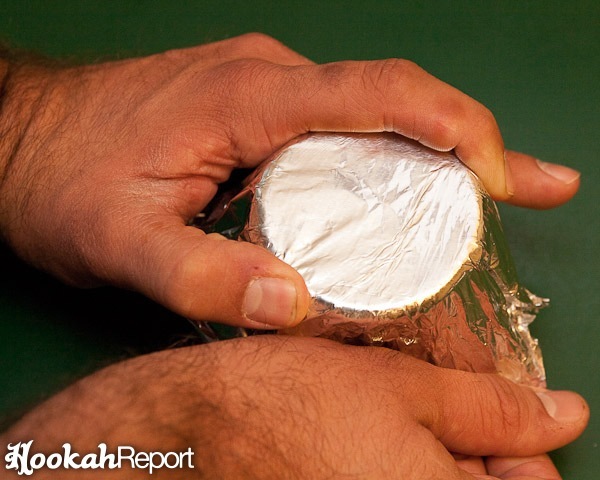 Once the shape of the bowl has been creased into the foil, you can let go. So now your bowl is sealed with smooth, tight foil and it’s ready to be punctured with a safety pin or tooth pick. Puncturing your tin foil, if not done carefully can undo all the hard work you put in to keep the foil tight. So, to prevent that, hold the bowl tightly around the top edge with one hand, and puncture the foil with the tool in the other hand. If your foil is good and tight, it should offer very little resistance when you force your tool through. Although there are many different patterns which you could use to puncture your bowl, here is a basic pattern for a standard bowl. 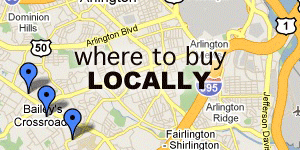 The size of the holes doesn’t matter too much, the general rule of thumb is this. If you puncture with something very small (like a safety pin), then you’ll want to use more holes. If you puncture with something larger (like a pen), you’ll want fewer holes. Your bowl is ready to smoke! 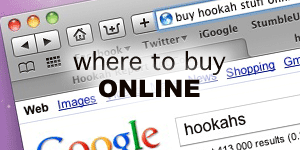 With your charcoal lit and your bowl ready, pull your hookah out and get ready to smoke. Oh, but wait, you’re not quite there yet. Your hookah still doesn’t have any water in it, you don’t have anything to drink or munch on and I’m pretty sure that’s not the end of the hose that goes into the hookah. Next time we’ll talk about the last few things you’ll need to consider before you get smoking. Like proper water levels and hose use. See you then!